This Brand Awareness Survey Template can be used to track the full measurement of brand awareness, including brand benefit, relevance, and believability. Thank you for downloading the Brand Awareness Survey Template! Choose your preferred download file type. Brand awareness reflects how many consumers recall or recognize the brand’s name or logo as being a member of the category in question. Awareness is the metric most commonly reported to boards as a measure of brand performance. This level of visibility makes it essential to highlight the distinction between various types of awareness measures. Brand awareness surveys should cover both your business and your competitor landscape. Use aided and unaided questions to capture the respondent’s prior awareness of your brand as well as their reactions to questions that actively trigger their awareness. In addition, you should track how many customers are aware of your brand benefit, your brand relevance, and believability. The goal is to understand what portion of your target market is aware of your brand and where you stand amongst the competition. The survey starts by asking how familiar your respondents are with your product or service and moves into open-ended questions and questions about your competitors. 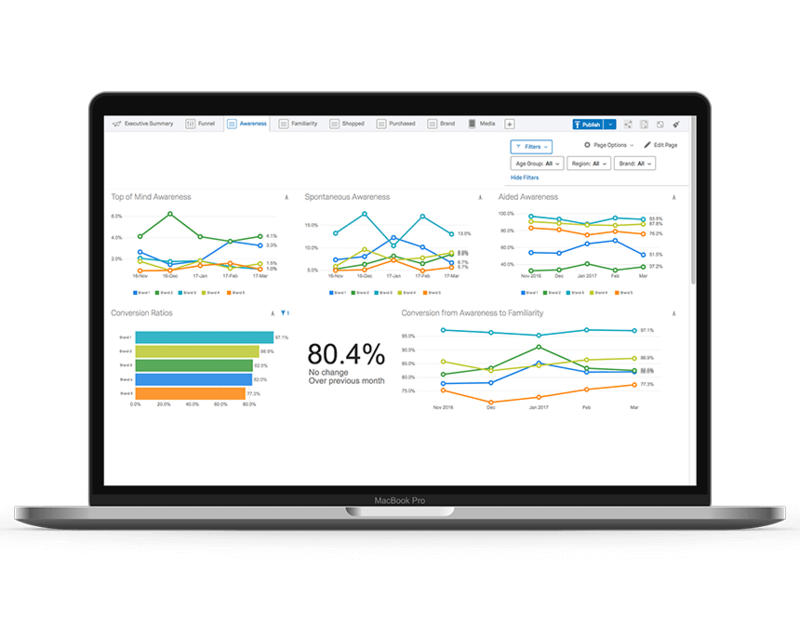 If you’re ready to take your brand awareness a step further, Qualtrics Brand Tracker Software allows you to create a robust brand strategy that’s designed with your organization’s values and goals in mind. Brand tracking studies help you identify threats and capitalize on unforeseen opportunities and verify which messages are resonating with your customers. Download our Brand Awareness survey template and use it with your Qualtrics Research Core™ account. Don't have an account? Create one for FREE today!